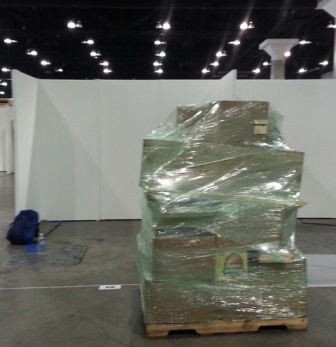 It was a big push to get Kri Kri Studio to the Dwell on Design show in Los Angeles. Over the course of one year, I built the range of VIT ceramic lamps up from one model to five and added the Eve vase to the vase collection. But developing and producing products is only part of the picture. I also needed a booth to display my wares. It needed to be designed, built, shipped to the show and set up on site. This time around I was on a pretty tight budget and challenged myself to get the job done spending as little money as possible by re-using as many materials as I could. My friends Lauren Grossman and Jil Smith shared some valuable input that helped me to arrive at a solution for displaying my products. I also got inspiration from the postcard that my husband, Nigel Foster, designed for the show. From just down the street at Terra Bella Flowers I scored two, thick 10′ long 2 x 10 planks. These became shelves for the lamps on the back wall. Just by cutting down wheel barrow handles a few inches, I instantly had some shapely supports for the rather substantial shelving. I used canvas salvaged from a previous display to cover the shelves and re-painted them. Smaller pieces of wood for the side wall shelves were easier to find. These I covered with a re-purposed straw blind from IKEA which added texture and visual variety. 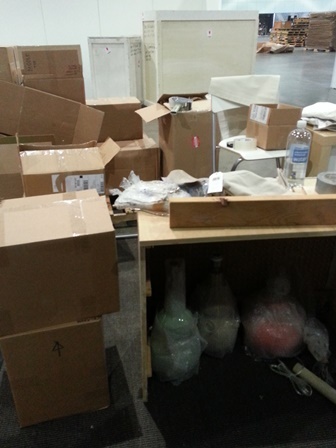 Bits and pieces from my tableware booths at NYIGF were re-used to build the freestanding box that doubled as a storage compartment. 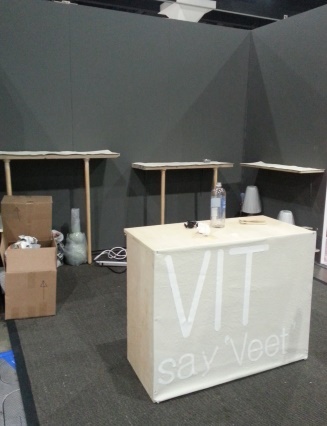 Perhaps the “VIT” letters had seen better days, but, I left them on the canvas for one last go. A lot of sweat equity went into this booth, but in the end, the only things I needed to purchase were brackets and screws, wheel barrow handles and paint. I did opt to buy a gray sisal rug with dark trim instead of renting the standard one. The cost was about the same but the resulting look was much classier. I will also add that I found my pallet (free) in the industrial district of Seattle. After it came back, I recycled it easily by sticking it outside the studio with a “free” sign on it. 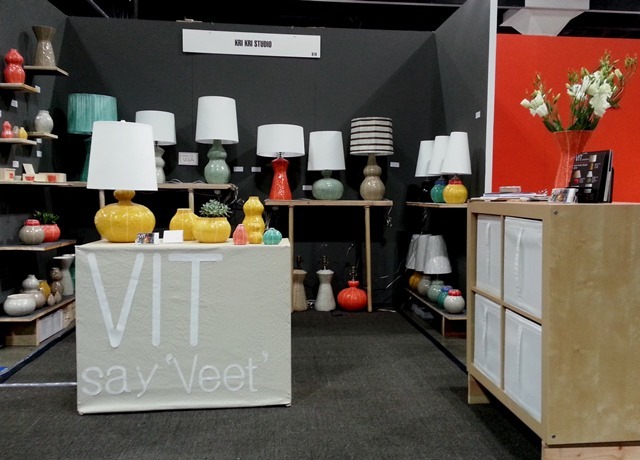 When it was all over, I felt the booth displayed both lamps and vases to good advantage. Visitors stepped in and were genuinely enthusiastic about my products. 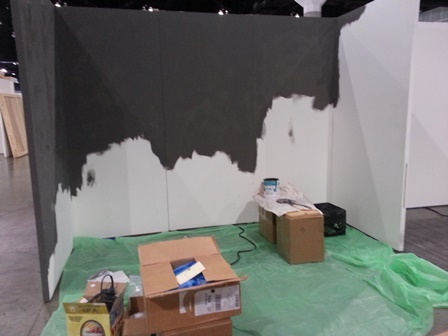 Now I have connections to follow-up on and am thinking forward, imagining what my booth will be like next year.